Most people have never heard of Robert Farquhar outside of NASA - and that is a shame. The cover of this book says it all. Look at this exquisite orbit Farquhar created to take an old spacecraft so as to repurpose it and throw it at not one but two comets. While the common perception of spacecraft is that they orbit planets in nice little circles or travel between one another in simple swooping arcs, that is not always the case. Farquhar is a practitioner of exotic - and esoteric orbits - things that swoop and swirl, meander and speed - all driven by Newton and Kepler - but done so with a flair neither Newton or Kepler could have imagined - or calculated. Farquhar's missions range from ISEE-3 to New Horizons. In some cases his task was simple - get a spacecraft from point A to B. In other cases he took a mission intended for one purpose and found a way to do something else with it. This book is both highly technical and deeply personal. It also takes a page from NASA Watch and includes all manner of internal memos to show how easy and hard it is to do things within NASA. 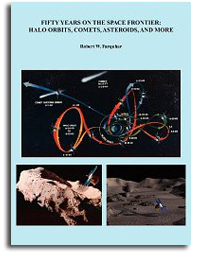 The reader is given a front seat to many of the most interesting space and planetary science missions of the last half century. They are also afforded a look into the back rooms and after hours work that often goes into doing things that no one has done before. Truth be known, this is a book about space exploration. It is also an art book.